The supernatural thriller will give Blu-ray the willies in January. 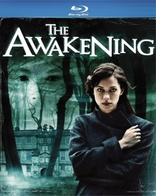 In an early announcement to retailers, Universal is preparing 'The Awakening' for Blu-ray on January 29. 1921, England. When a ghost is blamed for the death of a child at a prestigious London boarding school, famed author, noted skeptic and investigator Florence Cathcart (Rebecca Hall) is certain that science and reason can explain it. But when she's invited to the school by its headmaster, Robert Mallory (Dominic West), she discovers a truth more terrifying than anything she could have imagined. Before she understands everything that's unfolding before her very eyes, the ghost hunter becomes the hunted. Specs and supplements have yet to be revealed, but suggested list price for the Blu-ray is $26.98. You can find the latest specs for 'The Awakening' linked from our Blu-ray Release Schedule, where it's indexed under January 29.